Ashkenaz bi-monthly Pan-Celtic Ceilidh dance continues! Ceilidh means gathering in Celtic and the tradition always includes music and dance. 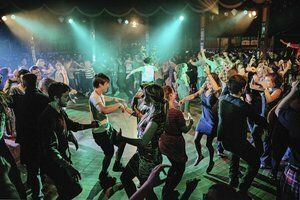 Ashkenaz's inclusive Ceilidh combine easy dances everyone can do in many styles including Irish Ceili, Contra, Scottish Ceilidh, English County Dance & couple dances such as waltz. Every dance is taught before it's danced and people are encouraged to dance all roles with everyone on the floor. This month's dance features callers Kalia Kliban and Alan Kline, and live music from The Woots (Shira Kammen,Deidre McCarthy, Jim Oakden, Charlie Hancock, and Mark Ungar). Since forming in 1988, Tempest has delivered a globally-renowned hybrid of high-energy Folk Rock fusing Irish reels, Scottish ballads, Norwegian influences and other world music elements. The last 26 years have seen the San Francisco Bay Area based act release fifteen critically acclaimed CDs and play more than 2,000 gigs. It's also enjoyed an evolving line-up that's enabled musicianship and creativity to rise with each new member. Hailing from Oslo, Norway, founding member and lead singer/electric mandolinist, Lief Sorbye, is recognized as a driving force in the modern folk-rock movement. He started Tempest after years of touring and recording on the folk circuit. San Francisco fiddler Kathy Buys brings her international award winning playing to the Tempest stage. Her experience performing world-fusion music with high energy dance bands combined with many years of playing Irish traditional music in America and Ireland makes her a perfect fit for Tempest. The newest member is Josh Fossgreen, an exceptional young talent whose innovative bass textures add a rich dimension to the Tempest soundscape. Born in Colorado and brought up in small town Missouri, Gregory Jones is the latest in a long line of Tempest guitar greats! His fiery licks and hard-rocking approach to the instrument, combined with his experience and understanding of Celtic music is a fast favorite with fans, new and old alike! Cuban-born drummer Adolfo Lazo, an original Tempest member, colors the band's sound with inventive rhythms, and rock-steady drumming. Signed to Sony-distributed Magna Carta Records, Tempest's releases are acclaimed worldwide. The group's latest studio CD, The Tracks We Leave, may be the bands most exciting work to date, as their unique blend of world music elements showcases inventive new original and traditional material. Quickly gaining recognition as one of Irish music’s new “super-groups,” RUNA has been enchanting audiences by pushing the boundaries of Irish folk music into the Americana and roots music formats since their formation in 2008. Interweaving the haunting melodies exuberant tunes of Ireland and Scotland with the lush harmonies and intoxicating rhythms of jazz, bluegrass, flamenco and blues, they offer a thrilling and redefining take on traditional music. The group has been honored internationally, winning Top Group and Top Traditional Group in the Irish Music Awards and three Independent Music Awards including Best LIVE Album, Best World/Traditional Song and Best Bluegrass Song. RUNA consists of vocalist and step-dancer, Shannon Lambert-Ryan of Philadelphia, Dublin-born guitarist, Fionán de Barra, Cheryl Prashker of Canada on percussion, Zach White of Missouri on mandolin, vocals, banjo, and flat-picking guitar, and Maggie White of Kentucky on the fiddle. Ashkenaz is proud to launch the first of our bi-monthly Pan-Celtic Ceilidh dances! The Ceilidh is a tradition of music, dance, and storytelling in Celtic traditions. In Ashkenaz's inclusive tradition, this first Ceilidh will combine easy dances everyone can do in many styles including Irish Ceilidh, Contra, English Country Dance & Ceilidh, and Waltzes & other couple dances. T he August Ceilidh will include Scottish traditions. Fula Brothers is the high spirited meeting of three seasoned touring performers - each of whom has spent decades pursuing the shared heartbeat in music from around the globe. Here is a history filled with inter-continental collaborations and colorful apprenticeships, from West Africa and Scotland to Haiti and the US. Each of these cultural threads stirs a unique part of our universal human experience, and Mamadou, Walter, and Kendrick weave them into a rich tapestry of sound and rhythm. The result? An ecstatic and intricate groove-based dialogue which the heart - and the feet - cannot resist. Formed in 1988, Celtic rock band Tempest has recorded 15 CDs and played more than 2,000 shows in near and faraway places, especially at Celtic fests from Philadelphia to the Winnipeg Folk Festival, Cropredy in England, and Denmark’s Skagen Festival. For a while the band even hosted its own Karflukifest with like-minded bands from around the world. Tempest fuses Irish reels, Scottish ballads, Norwegian influences, and other world music elements in its high-energy concerts. The new CD, “The Tracks We Leave,” is officially released Feb. 24 on Magna Carta Records. The title is inspired by a Dakota Sioux proverb: “We will be known forever by the tracks we leave,” a reference to the environmental, spiritual, and musical imprints we leave upon the world we live in. Hailing from Oslo, Norway, Tempest’s founder and lead singer-electric mandolinist Lief Sorbye is recognized as a driving force in the modern folk-rock movement. He started Tempest after nine years in pioneering Celtic folk band Golden Bough. San Francisco fiddler Kathy Buys brings her international award-winning playing to the Tempest stage. Born in Colorado and brought up in small-town Missouri, Gregory Jones is the latest in a long line of Tempest guitar greats. His fiery licks and hard-rocking approach to the instrument, combined with his experience and understanding of Celtic music, have made him a favorite with fans new and old alike. Cuban-born drummer Adolfo Lazo, an original Tempest member, colors the band’s sound with inventive rhythms and rock-steady drumming. The newest member is Josh Fossgreen, an exceptional young talent whose innovative bass textures add a rich dimension to the Tempest soundscape.